The table is set, and guests are soon to arrive. to enjoy a Tea Friends Gathering in Kentucky. to post our fun tea adventures. So excited to be one of those guests! Looking forward to seeing you. Have fun! Sure wish I could be there! Will be there in spirit! Big hugs to all who meet up - I am so jealous and wish I could, too! 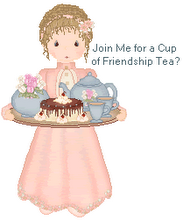 Your table is very pretty and your Tea Friends gathering sounds intriguing! I am going to a "Green Tea Sampler" at Clara J's Tea Room in Maumee, OH tomorrow. What a beautiful St. Patrick's table! Happy St. Patrick's Day! Lovely tablescape. Hope you had a great time! That table you set is exquisite. Love the place settings, and the adorable napkin rings! I wish I could be there with you tea bloggers next week! But since I just got back from a vacation week, I will be satisfied with that, and with looking forward to hearing about your gathering. Have a wonderful time!